A small, but neat falls. The clear water, which sometimes splits into multiple streams as it falls around the boulder at the top (and sometimes runs more on one or the other side of the boulder) drops into a slot in the rock and exits the small "canyon" through walls of angled, layered, moss-covered rocks. You get a great view from the bridge over the creek. Hop on the Blue Ridge Parkway and head either north or south to the Linville Falls area at milepost 316.4. From Asheville, it's about 65-70 miles scenic miles north depending on where you got on, and you'll pass the Craggy Gardens, Mount Mitchell and Crabtree Falls areas. From Boone/Blowing Rock it's about 35-40 miles South and you'll pass Grandfather Mountain. Turn onto Linville Falls Road; go 1.5 miles and park at the visitor center where the hike starts. Note: The section of the Parkway between Asheville and N.C. 80 near Little Switzerland is frequently closed while the section near Linville Falls is still open; there are plenty of places to access the Parkway closer to Linville if this is the case (or if you want a quicker trip). Use your favorite mapping website to find the best route. The loop path to the falls is easy and about 1/2 mile long. From the Linville Falls visitor center, go up the stairs on the trail to the left (the Plunge Basin trail). At the top of the steps, turn left onto the trail. The path leads about 1/4 mile to the bridge over the creek, and the falls. 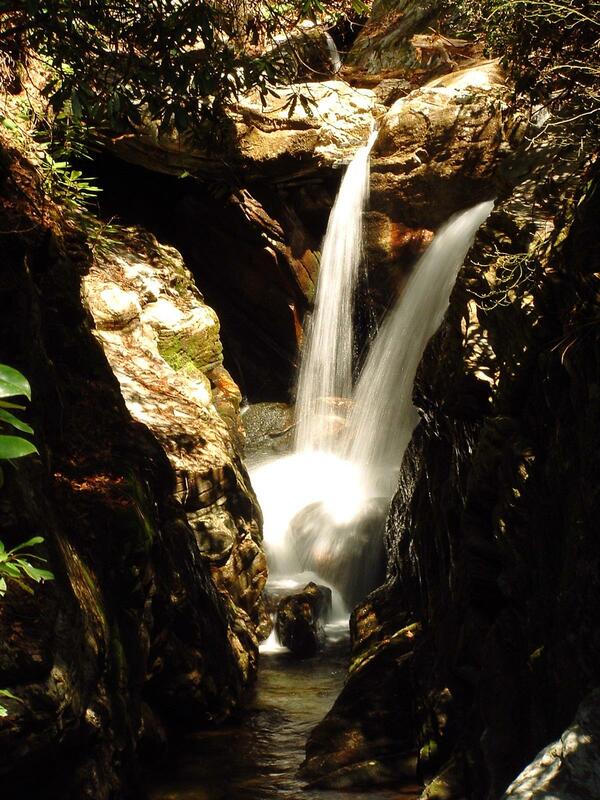 If you're coming from the back lot, head down the trail to the main Linville Falls trail and turn left. This will take you across the bridge to the visitor center, where you can hit the Duggers Falls loop.